The city of Urbino has ancient origins Nothing is known about the first settlements, prior to the Celtic invasions and the settlement of the Gauls Senoni (4th century BC), but recent findings of archaeological material, especially ceramic fragments dating back at the age of the iron- confirm the presence of a settlement probably of the IV sec. to. C. About a century later, the Romans subdued the Senoni Gauls and quickly conquered all the Marche region. Since then the story of Urbinum Metaurense began. The Roman city of Urvinum Metaurense became an important center during the Gothic Wars in the 6th century. It was then taken in 538 by the Byzantine Belisarius, taking it from the Goths, and was frequently named by the Byzantine historian Procopius. It then passed into the dominion of the Lombards and then the Franks. The king of the Franks Pippin offered Urbino to the State of the Church. 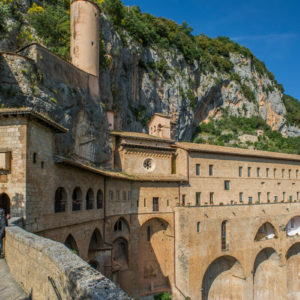 However, independent and autonomous traditions were expressed in the form of government of the City until, around 1200, fell under the dominion of the nobles who fought each other in the nearby Montefeltro. These nobles had no direct authority over the commune, but exerted pressure on their election as mayor, a title that Bonconte di Montefeltro managed to obtain in 1213, with the result that the Urbino rebelled, formed an alliance with the independent municipality of Rimini ( 1228) and in 1234 they regained control of their city. 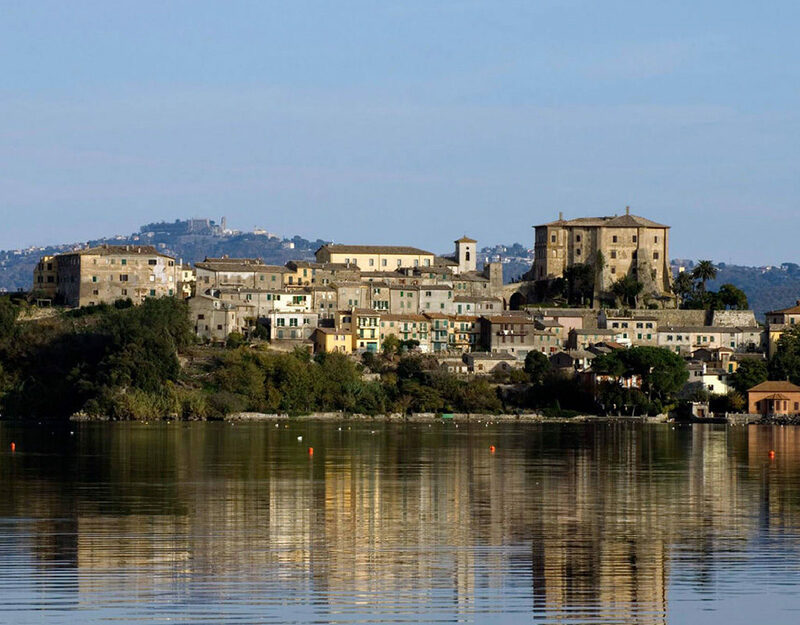 Subsequently, however, the Montefeltro managed to take back the reins of the city that then controlled until 1508. During this period, Urbino took the aspect that in part still today has, with its walls. 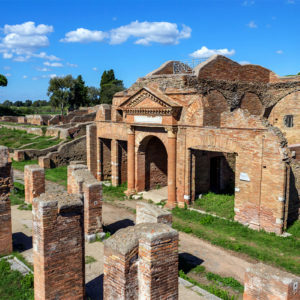 In the battles between the Guelphs and Ghibellines, the lords of Urbino of the thirteenth and sixteenth centuries were leaders of the Ghibellines of the Marches and Romagna, and associated with families or Ghibelline cities. The most famous exponent of the Montefeltro family was Federico, lord of Urbino from 1444 to 1482, successful leader, highly skilled diplomat and enthusiastic patron of arts and literature. At his court, Piero della Francesca wrote about the science of perspective, Francesco di Giorgio Martini wrote his treatise on architecture (concluding the renovation of the Palazzo Ducale started by Luciano Laurana), and Raphael’s father, Giovanni Santi, wrote his poetic account of the main artists of the period. The brilliant court of Federico, through the descriptions of Baldassare Castiglione in Il Cortegiano, introduced the characters of the so-called “gentleman” in Europe, which remained until the First World War. Cesare Borgia dispossessed Guidobaldo da Montefeltro, duke of Urbino, and Elisabetta Gonzaga in 1502, with the complicity of his father, Pope Alexander VI. After the attempt of Pope Medici, Leo X, to appoint a young Medici as duke, Urbino remained part of the Papal State, under the dynasty of the Della Rovere dukes. In 1626 Pope Urban VIII incorporated the independent Duchy of Urbino into the papal territories, a gift from the last duke Della Rovere, withdrawn after the assassination of his heir, to be governed by the bishop. The great library was moved to Rome and added to the Vatican Library in 1657. The subsequent history of Urbino is part of the history of the Papal State and, after the plebiscite of November 4, 1860, of the History of Italy. In the Ducal Palace of Urbino, a symbol of Italian art is preserved: it is the “Ideal City” attributed to critics by Piero della Francesca, Leon Battista Alberti, Luciano Laurana, Francesco di Giorgio Martini and other artists. Admire this painting, which like the Gioconda is in the collective imagination of all, is the best way to understand what has represented Urbino for Italian and world art. In his perspective rigor embodies the dream of Federico da Montefeltro, shared by the artists who surrounded him, to build the ideal Renaissance city. Wandering through the alleys, palaces and squares, you realize that the Duke has not gone so far from the lens. 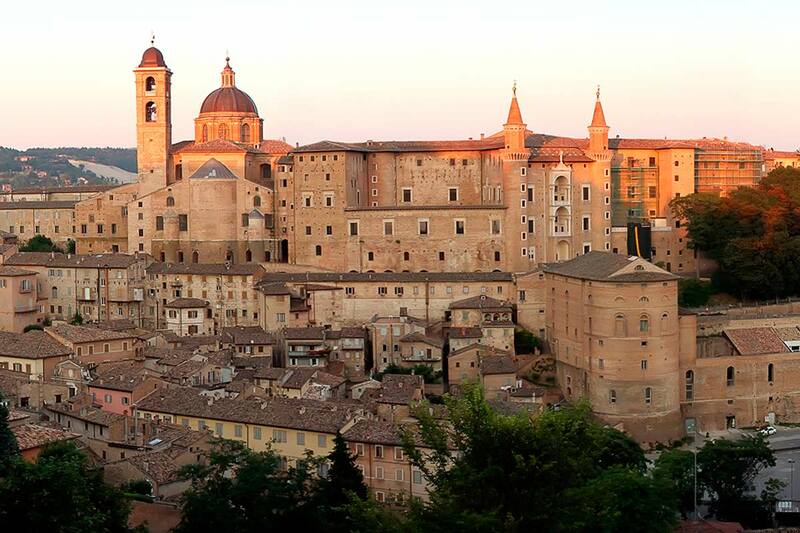 The historic center of Urbino, in fact, is protected as a World Heritage Site by UNESCO. 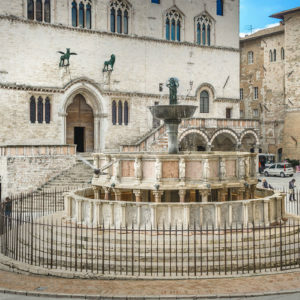 In a few hundred square meters, a heritage that has marked the art and architecture of Europe for many decades is concentrated. To define the Palazzo Ducale only a “palace” is absolutely reductive: it is a small fortified city built by Federico da Montefeltro and built starting in 1444. 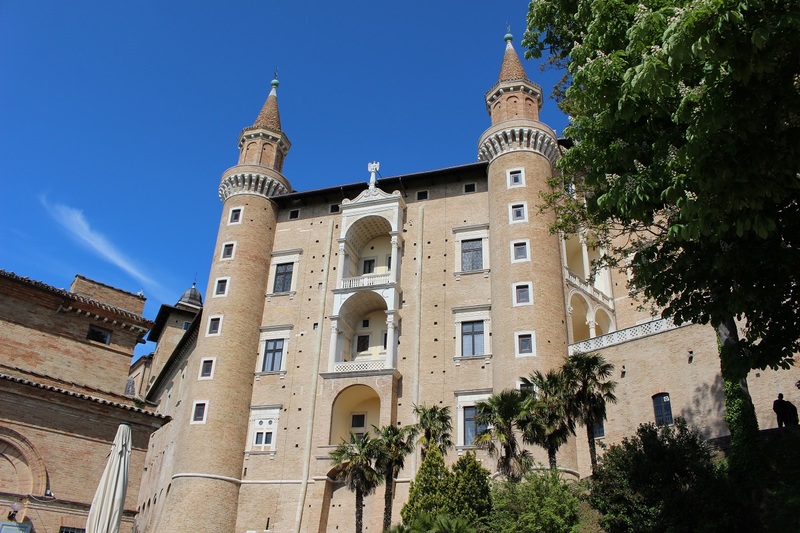 Cultured and refined, Federico wished that the Ducal Palace of Urbino would outnumber all the other princely residences of Italy. 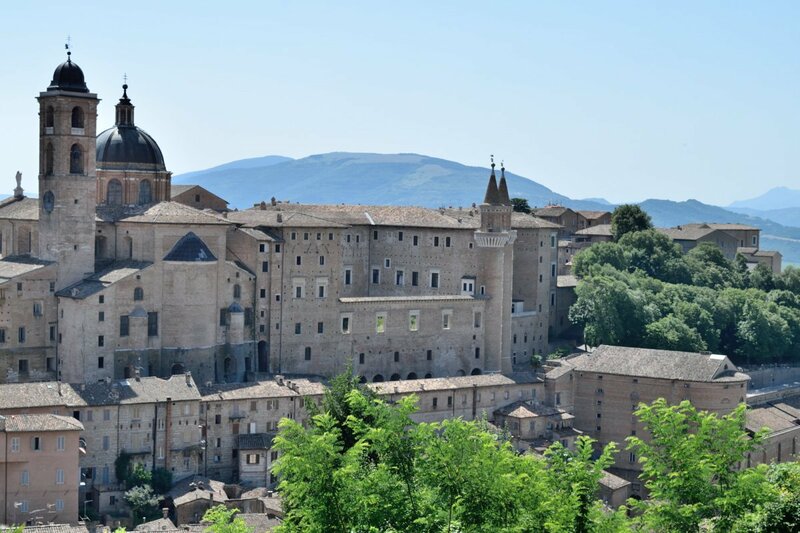 It was not just a way of celebrating one’s own power: he wanted to transform Urbino into the “ideal city” of which the Palace was to be the highest expression. In addition, he loved artists and wanted a place to host them and get them to work. The building saw several architects engaged for more than 30 years. Maso di Bartolomeo (Palazzetto della Jole, apartment of Melaranci and part of the courtyard) followed one another, Luciano Laurana (porticoed courtyard, the honor staircase, the Library, the Sala degli Angeli, the Sala degli Udienze, the Soprallogge , the area sacred with the studiolo) and Francesco di Giorgio Martini who completed the outstanding works. The two most beautiful testimonies of this thirty-year work are the “Facciata dei torricini”, perhaps the most photographed point of Urbino and “Lo studiolo” rightly defined as a “treasure trove of beauty, refinement, perspective …”. Today the Doge’s Palace houses the National Gallery of the Marche with works by Raphael, Titian and Piero della Francesca. About 80 halls of the Doge’s Palace have been used as a museum and host the works of the National Gallery of the Marche. The collection includes works from 1300 to 1600, mainly paintings but also furniture, sculptures, tapestries and drawings. The main works are on the first floor, divided between the apartments where the Duke and his family lived. In the Appartamento del Duca there are two masterpieces by Piero della Francesca: the Flagellation of Christ and the Madonna of Senigallia. The birthplace of Raphael houses only a few original works by the great painter of Urbino, almost all of them young, but it deserves a visit because the history of art has passed from here. Located in the artisan district, in this house Raffaello Sanzio was born on 28 March 1483 and spent his childhood forming in the workshop of his father, an artist at the court of Federico da Montefeltro. 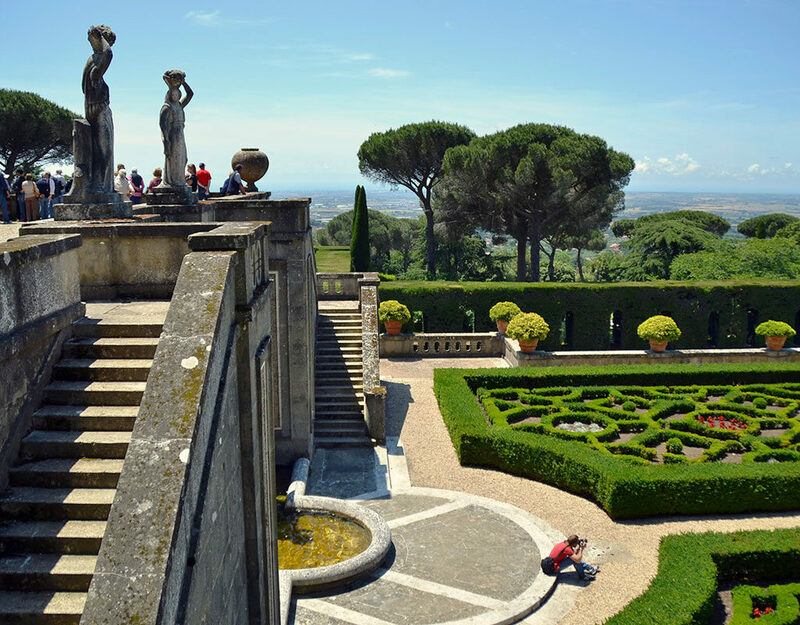 After alternating events, in 1873 the house was acquired by the Accademia Raffaello and since then it has received works related to the life of Raphael and his time. On the ground floor there is the workshop of his father Giovanni Santi, now used for temporary exhibitions. On the first floor there are copies of Raphael’s paintings and tributes of other artists to the great urban painter. In the “Bedroom of Raffaello” there is a fresco depicting the “Madonna with Child” considered a youth work done together with his father. On the first floor there is also a small courtyard with the well and the sink where the colors used for the works were ground. Do not be fooled by the banal Gothic facade of the early 1900s. The masterpiece of the Oratory of San Giovanni is well hidden beyond the entrance door and is painted on the walls: it is the cycle of frescoes by Lorenzo and Jacopo Salimbeni from San Severino (1400) about), most important interpreters of the late gothic Marche. You are immediately struck by the “Crucifixion” that covers the entire apse wall: the eyes go to the three crosses, as the classic iconography wants. Jesus at the center and the two robbers on the side: but slowly approaching and entering into the details, we realize how much humanity revolves around the Passion of Christ. Desperation and indifference, animate the scene, transporting it from religious to the earthly reality. The oratory takes its name from the frescoes on the right wall that in the two orders, lower and upper, illustrate the life of St. John the Baptist. On the left wall a Madonna of Humility is painted. 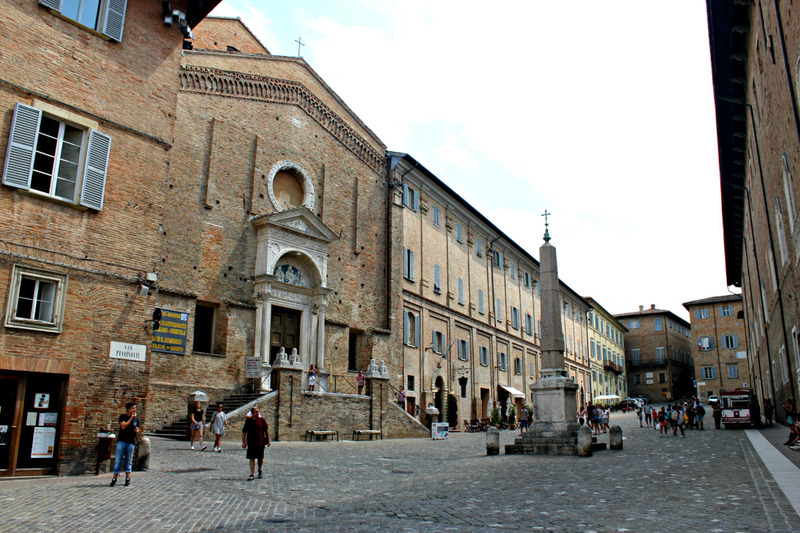 The Cathedral of Urbino is the most important church in the city but certainly not the most beautiful. History has not been generous with the churches that have followed in this place: the first building dates back to 1021, replaced by a new church built by Francesco di Giorgi Martini, the trusted architect of Federico da Montefeltro who worked for many years also at the nearby Palazzo Ducale. After the earthquake of 12 January 1789 the Roman Giuseppe Valadier was entrusted with the task of building the current Cathedral in the neoclassical style. Inside there are two beautiful paintings by Federico Barocci: the Martyrdom of San Sebastiano and the Last Supper. The most interesting part of the Cathedral is the Caves that over the centuries have hosted a Confraternity. During the Second World War, to protect them from bombs and Germans, the caves housed the works of the Treasure of the Basilica of San Marco in Venice. In the caves there are several chapels and the Corridoio del Perdono: according to an ancient tradition of Urbino, forgiveness from sins was ensured by crossing this corridor several times during Easter Monday.